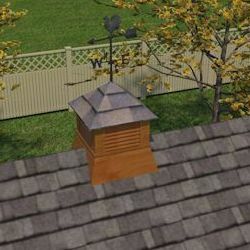 Free Cupola Plans With Order! Your instant pdf formatted plans digital download is available via email immediately after paying through paypal. 26 pages of detailed blueprints in color on 11x17 size paper (plans are scaled and must be printed on 11x17 paper for scale to be accurate). 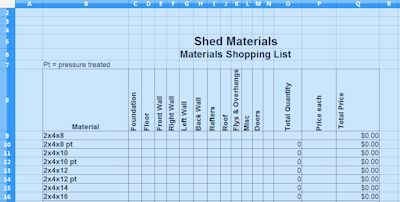 Materials list broken down by each section of shed construction 8.5x11 size. 38 page Barn Shed Building Guide, illustrated and in full color, 8.5x11 size. 10' wide x 10' long x 12' 10" tall. Treated 2x4 floor joists spaced 12" on center. Treated 4x4 support skids under the floor joists. 2x4 wall construction with wall studs spaced 24" on center. Plans show 7/16" thick 'Smartside' 4'x8' engineered pre-primed siding panels. 5' Double shed door 6' 4.5" tall. 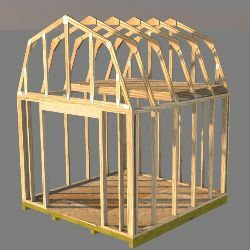 2x4 trusses you pre-build spaced 2' on center. Gable end venting that can be used in conjunction with a ridge vent. 2x6 loft flooring that can be sheeted with 3/4" flooring. Roof sheeting consisting of 1/2" osb panels or 1/2" plywood. Decorative front and rear 2x6 roof overhangs and side overhangs. This materials list is broken down by section and also shows quantity totals for each specific building material. This materials list is available for download in pdf format by clicking here. You can use this list to take to your favorite lumber store to get a building materials total cost before you begin your construction. 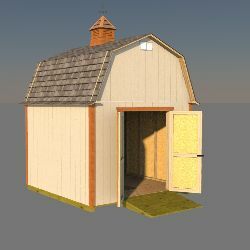 Included in these 10x10 barn shed plans is email support. If you have a question or problem with any aspect of the plans, or just need to clarify something while you are building your shed, you can just email me and I will answer as soon as I possibly can. I typically get back answers to emails within 48 hours tops, but usually the same day as the email is received. This all just depends on how many people are in line to get emails answered! You can purchase these plans for immediate download for just $6.95 via the Buy Now button below. Purchases on this website are made securely through paypal. As soon as your purchase has gone through, you will immediately get a download link via email from e-junkie.com. 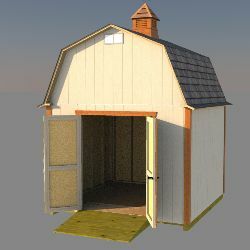 Clicking on this link will download your shed plans. Possible reasons for not receiving the download link could be that your email provider has treated the link as spam or junk, or your anti-virus program is blocking the link from showing up in your browser window. In any event, if you do not receive the link, I will send the plans to you via email attachment. See all of my barn shed plans.